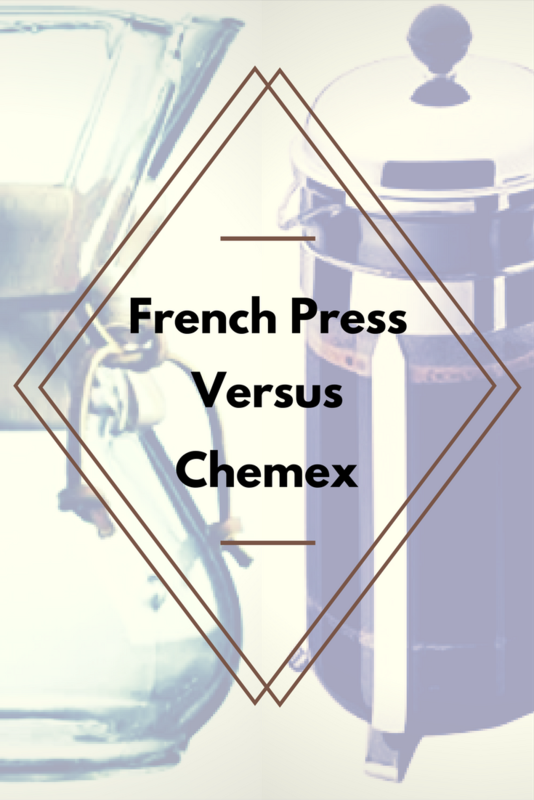 Home/Chemex, Equipment Reviews, French Press/Chemex vs. French Press: Who Wins the Best Coffee Battle? If you’ve been contemplating life beyond the drip coffee maker or don’t need to brew for a crowd, a French press and Chemex are both viable solutions. Both rely on simplicity to get the job done and are reasonably priced. While both begin with a medium/course grind, the extraction method is what sets the two apart. Because of this, they produce two distinctly different cups of coffee. There are a few things you should take into account before deciding which method is best for you.Before we dive into the specifics, let’s take a closer look at the contenders. Consisting of a plunger attached to a lid with a mesh filter and a brewing chamber, a French press is available in sizes ranging from 8 to 36 ounces and you can even find presses made for camping or travel. Brew chambers are made out of glass, plastic, stainless steel or ceramic. To brew, begin by pouring 195-200F water over coarse ground coffee, soaking the grounds before allowing it to bloom for 30-60 seconds. 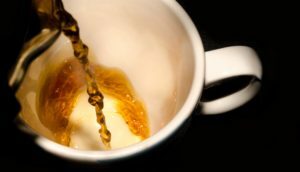 Coffee blooms when hot water forces the coffee to release trapped gasses, which results in the enticing aroma. After it blooms, give it a stir with a wooden spoon to break the crust. Then pour the remaining water over the grounds, allowing it to sit for 3-4 minutes. Then plunge and enjoy. A French press produces a full-bodied, oily coffee, which is heavy and robust. A Chemex is more than just a means to brew coffee: it’s also a work of art, as evidenced by the fact that it resides in the Museum of Modern Art. Invented by chemist Peter Schlumbohm, the Chemex works through the process of cold filtering. Essentially a solution is poured into a funnel and then gravity removes the liquid. The Chemex ranges from 3 to 8 cups and is made out of glass. One distinct difference between a Chemex and a French press is that Chemex’s use of a paper filter. To make coffee, begin by adding medium/course grounds to a Chemex-specific paper filter. Next soak the grounds with water that’s around 195-200F, then allowed it to bloom for 30 seconds. Then slowly add the rest of the water, using a swirling, circular motion to evenly cover the grounds. The entire process takes about 4 minutes. To perfect your method, you can find more detailed instructions here. A good choice for light and medium roasts, the Chemex results in a crisp, clean cup of coffee. French Press: You can knock out a pot of French press in about 5 minutes. This doesn’t include grinding time and the time it takes the water to heat up. Plus, you have the added bonus of being able to walk away while the coffee is extracting. Chemex: At least 4 minutes, depending on how much coffee you’re making. With the Chemex, you also have the added steps of rinsing the filter and being present the entire time to slowing pour the water. Winner: French press for its set extraction time and the ability to leave it once the water is added. French Press: The appropriate coffee grind (medium/coarse), water temperature (195-200F) and extraction time (4 minutes), will yield a consistent and predictable cup of coffee every time. For the coffee newbie, this fits the bill, as it’s pretty difficult to screw up. Chemex: While a Chemex is still fairly easy to get the hang of, it does require a few additional steps and a little more attention to detail than a French press. A Chemex requires a paper filter that’s specific to the brand because these filters are wider and 20-30% thicker than a traditional coffee filter. Before you begin, you should rinse the filter to remove any dust or paper taste and to warm up the brewer. Unlike a French press, where water is added to the coffee and left to sit, a Chemex requires a bit of finesse. Part of the reason why this coffee tastes so delicious is because it requires some technique to evenly extract the beans. After the coffee blooms, you’ll want to pour water in a spiral pattern for an even extraction. It’s important for the grounds to undergo a consistent temperature and brew time, which affects the end result. Winner: A French press is much simpler to use and more idiot-proof than a Chemex. Its ease of use also makes it a good option for travel or for a quick cup of coffee at the office. Chemex: The Chemex may require a little extra work on the front end, but cleanup is a snap. Just throw away the filter, wash out the pot and call it a day. French press: Scraping out used coffee grounds post-extraction takes some of the fun out of the French press. However, the brewing chamber is much easier to scrub than the thin-necked Chemex. Winner: Chemex. Because we have yet to discover a fast and efficient way to remove the grounds from a French press. French Press: A French press is a one-time purchase and doesn’t require additional accessories. 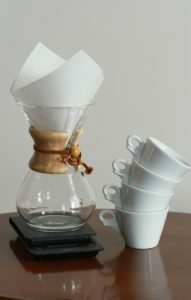 Chemex: The Chemex has the additional cost of paper filters and you must use Chemex brand. Winner: French Press. Both this is really splitting hairs, as they are both pretty cost efficient and similarly priced, but the French press doesn’t require filters. Both the French press and the Chemex require a medium/course ground bean. Preferably, you should invest in a burr grinder, as freshly ground beans will help produce the best flavor. While you can get away with measuring the water and coffee, a scale is preferred to determine the perfect amount of coffee and water for the Chemex. You’ll also find that it’s much easier to achieve the proper pouring technique with a gooseneck kettle. Winner: French press. A few additional accessories will enhance the coffee produced by the Chemex. The Chemex is a one-trick pony, whereas a French press can also be used to brew loose tea or make cold brew. Chemex: Because of the filter, the Chemex produces a cleaner and brighter coffee with no residual sediment. Using a filter, however, comes at the cost of capturing the oils that provide part of its flavor profile and some of the health benefits. French press: Don’t drink that last sip! One of the turnoffs of a French press is the sediment it leaves in the coffee. Grinding the beans at the proper setting and using a higher end French press (some have double filters) can help reduce some of this, but it’s tough to eliminate all the fine silt. On the other hand, the lack of a filter allows all the oils to remain for a rich, full-bodied flavor. Winner: This category goes completely to your own personal preference. 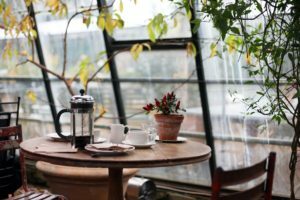 By choosing either a French press or a Chemex, you’re already ahead because, unlike a drip coffee maker, Aeropress or Keurig, you’re able to have greater control over the factors that lead to the end result. 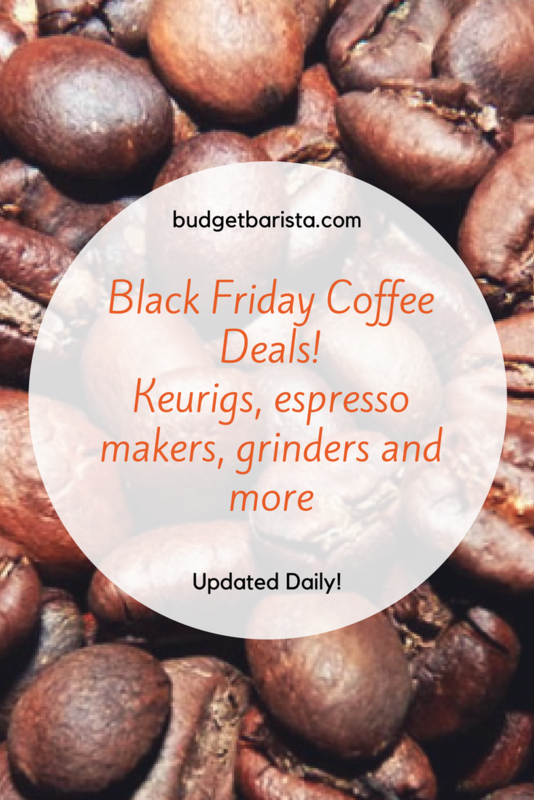 If you want to start channeling your inner barista, both are excellent additions to your kitchen. 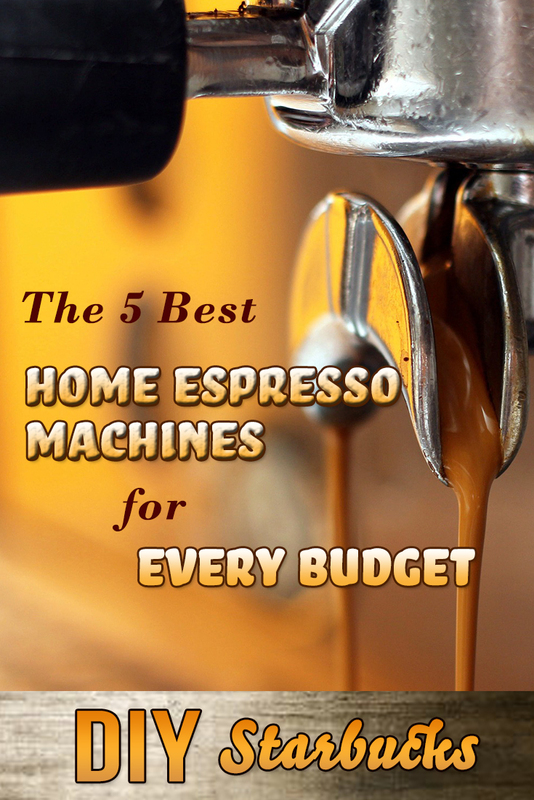 And, because they’re fairly inexpensive, you could feasibly consider adding both to your coffee arsenal. If time is tight or you need something portable, go with a French press. But if you have a little extra time and want to up your coffee game, I’d highly consider a Chemex. In the end, it comes down to taste and which you prefer. Sure it’s great to be able to pour a quick French press on days when timing is tight, but, for me, to be able to take the time to enjoy a Chemex is what the art of drinking coffee is all about. For my palate, it comes down to flavor, and this is where the Chemex hits all the high points.